Our results partner, Decision Desk HQ has called Utah's 4th congressional district for Ben McAdams. This is the 39th pickup for the Democratic Party. Only one race - Georgia's 7th district - remains uncalled. Republican incumbent Rob Woodall is favored here; but the challenger Carolyn Bourdeaux has requested a recount. Assuming Woodall wins in Georgia, the new House will begin with 234 Democrats, 201 Republicans. This gives Democrats 16 more than the 218 needed to control the chamber. Republican Will Hurd has won a 3rd term in the 23rd congressional district of Texas. While, the vote remains very close, his Democratic challenger Gina Ortiz Jones conceded on Monday. As of this writing, the race hasn't officially been called by the Associated Press or our results partner, Decision Desk. However, we have updated our 2018 Actual Interactive Map to reflect the expected outcome. Two other races remain uncalled, GA-7 and UT-4. The Georgia race has already been certified, with Republican incumbent Rob Woodall the apparent winner. However, the Democratic challenger, Carolyn Bourdeaux will request a recount given the very small margin that separates the two. In Utah, incumbent Republican Mia Love pulled ahead of Democrat Ben McAdams on Friday. There are about 34,000 provisional ballots left to be counted, with the candidates separated by just 419 votes. Incumbent Democratic Sen. Bill Nelson conceded the Florida Senate race Sunday afternoon. Gov. Rick Scott prevailed after two rounds of recounts. Republicans have secured 52 Senate seats compared to 47 for Democrats, ensuring the party maintains control of the chamber. The Mississippi runoff election will decide the final seat. Six of the 34 races completed resulted in a victory for the out-party. Republicans picked up four of those wins, Democrats two. Click the image below to see all the results; you can then click any of the state for vote totals from that race. We also have an interactive version of the 2018 actual results. The Mississippi runoff is scheduled for Tuesday, November 27th. Republican incumbent Cindy Hyde-Smith is favored in this deep-red state. However, with both parties adding resources, and Donald Trump planning two election-eve rallies, the race is looking more competitive than originally expected. Much of the tightening can be traced back to an offhand comment Hyde-Smith made about lynchings as well as her unwillingness to address the controversy it caused. Democrat Stacey Abrams effectively conceded defeat Friday afternoon, acknowledging that Republican Brian Kemp will be Georgia's next governor. All 36 gubernatorial elections have now been called by our results partner, Decision Desk HQ. Prior to the election, Republicans held 33 of the 50 governorships, with 16 Democrats and 1 independent holding the remaining seats. Democrats flipped seven seats, winning Republican-held seats in Illinois, Kansas, Maine, Michigan, New Mexico, Nevada and Wisconsin. The lone GOP gain came in Alaska. Click the image below to see the results for all 36 elections. We also have an interactive version of the 2018 actual results. Next year will see gubernatorial elections in Kentucky, Louisiana and Mississippi. First term governors Matt Bevin (R, KY) and John Bel Edwards (D, LA) are expected to seek re-election. Gov. Phil Bryant (R) is term-limited in Mississippi. The 2019 elections will be held on Tuesday, November 5th. Although a handful of districts remain uncalled, we now know which party will be in the majority in each state's 2019 U.S. House delegation. Republicans will have the majority in 26 states, while Democrats will have the most members in 22. Two states, Michigan and Pennsylvania will be tied. The concentration of Democratic districts in a small number of states gives the GOP a structural advantage in this count. They will hold the lead despite a Democratic majority overall. However, this marks a significant improvement for Democrats relative to the current House, in which the GOP has a partisan edge in 32 states to 17, with Maine the lone tie. Come January, Democrats will be in the majority in five additional delegations: Arizona, Colorado, Iowa, Maine and Virginia. That's nice info, but who cares? The count would come into play if a presidential election ended with no candidate reaching 270 electoral votes. In that case, the House would select the president, with each state receiving one vote. Note that should this occur with the 2020 election, it is the House elected in November, 2020 that would take the vote. The partisan distribution by state could be totally different after the next election, of course. Here's the data in a Google Sheet. Democrat Jared Golden has defeated incumbent Republican Bruce Poliquin in the closely-contested race for Maine's 2nd congressional district. Golden prevailed via the state's ranked-choice voting process, which kicked in when none of the candidates received a majority of the initial vote in this four-person race. Maine's largely rural 2nd district - the largest by area in the Eastern Time Zone - went for Donald Trump by 10 point in 2016. This earned the president an electoral vote in the state, which is one of only two that uses an allocation method other than winner take all. Democrats now have 231 seats, Republicans 199, with five contests remaining undecided. The 2020 electoral battleground map starts out much broader than in any presidential contest since 1992, according to an analysis in the Axios AM Newsletter on November 15th, 2018. "To win re-election, President Trump must wage a two-front war: Not only does he have to defend Democratic-leaning Midwest states that sealed his victory in 2016, but he now needs to defend against clear Republican erosion in the South and Southwest." Doug Sosnik, who did the analysis, says "Changing demographicsand Trump have blown up the electoral map that has dominated American politics since 1992." An interactive version is below. Use it as a starting point to create and share your own 2020 election forecast. Democrat Andy Kim will win in New Jersey's 3rd congressional district. The election was called Wednesday afternoon by our results partner Decision Desk HQ, as well as by the Associated Press. This is the 230th seat won by Democrats, a net gain of 35. Six races remain uncalled. In our pre-election New Jersey House overview, we noted that "If Democrats have a particularly good night, 19 term Rep. Christopher Smith (NJ-4) may be the only Republican in the New Jersey House delegation in 2019." With Kim's victory, that will indeed be the case. Democrat Josh Harder is the projected winner in California's 10th congressional district. He defeated four-term incumbent Republican Jeff Denham. This marks the 34th net gain for Democrats in the House midterm elections, giving them 229 seats. Republicans currently have 199, with 7 seats remaining to be decided. This is the fourth gain for Democrats in California, giving them a 43 to 8 margin in the state's 53-person House delegation. The 39th and 45th districts remain uncalled. These are both GOP-held seats in the Los Angeles area. The Associated Press projects Democrat Kyrsten Sinema to win the closely-contested Arizona Senate race. 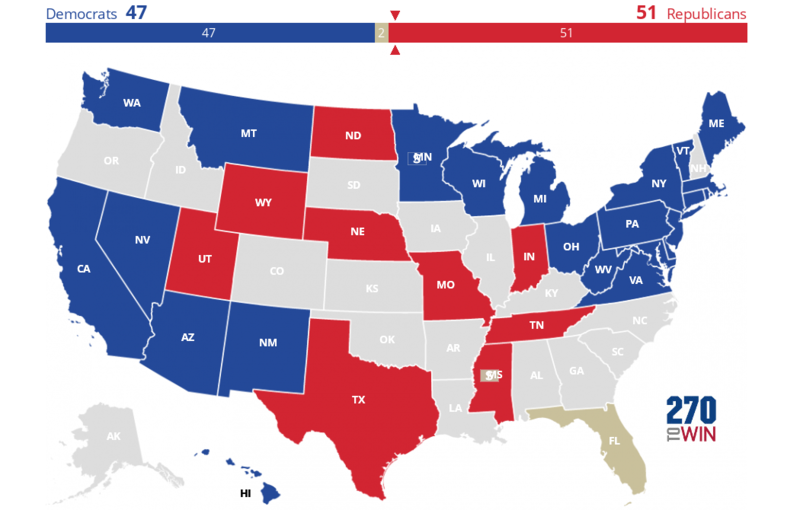 After this call, Republicans hold 51 Senate seats, Democrats 47, with two races remaining undecided. Those are in Florida and Mississippi. In Florida, Sen. Bill Nelson and his GOP challenger, Rick Scott, are separated by less than 0.25%, with a contentious recount underway. The Mississippi race is a special election, and will be decided in a runoff on November 27th.